Potnetwork Holdings Inc (OTC PINK: POTN) is currently on the watchlist of most cannabis sector investors, and not without good reason. The company’s operational and financial performance in 2017 greatly surpassed analysts’ expectations, a milestone that has already been priced into its share price. It was trading at $0.40 at the time of writing, up more than 600% from $0.06 on 26th December 2017. The company, which currently has a 30 day average trading volume of 20.4 million shares against outstanding shares of 269 million, is expected to sustain this explosive rally. This is according to a research report by SeeThruEquity, an equity research firm focused on emerging growth companies. SeeThruEquity expects POTN to hit $1.25 on continued strong financial and operational performance. POTN’s key operational subsidiary, Diamond CBD, posted approximately $14.5 Million in revenues in 2017. This is in comparison to sales of $1.6 million in 2016 and more than 70% higher than initial 2017 revenue estimates of $8.3 million. Diamond CBD focuses on research, development and multi-national marketing of premium hemp extracts and has over 15 brands in the market. Its explosive growth in the past year is not only attributable to strong execution by the management, but also broader market trends. Hemp-based CBD is excluded from the definition of marijuana under the Controlled Substances Act. This means Diamond CBD’s products, which are all hemp-based, are federally legal and outside of the purview of the Drug Enforcement Administration. Diamond CBD is therefore not under immediate threat from Attorney General Jeff Session’s ongoing war against marijuana. Tellingly, the company has a presence in all 50 states where it distributes its brands through 10,000+ retail outlets. Diamond CBD faces limited regulatory risks—at least in comparison to marijuana-based CBD players and other players in recreational marijuana. As the differences in legal classification of hemp-based CBD and marijuana-based CBD become clearer over time, players like Diamond CBD may record higher sales due to shifts in consumers’ and policymakers’ perceptions. This gives it a long-term competitive advantage in the market. Based on its research, SeeThruEquity expects POTN’s revenues to increase to $22.8 million in 2018 and $41.1 million in 2019. The positive operational and financial outlook is the basis of SeeThruEquity’s $1.25 price target. Crossing the $1, which is a psychologically critical price for small cap stocks, will create greater visibility for POTN, allowing it to execute on its short-term plan to uplist shares to the OTCQX. As interesting as this sounds, the bigger question is whether or not POTN’s ambitious price target is grounded in solid fundamentals. In other words, are these sales estimate reasonable; and is $1.25 a reasonable valuation in view of these estimates? Before examining valuation metrics such as price to sales ratio and doing peer comparisons, it is first important to interrogate the objectivity of SeeThruEquity’s research report. It is not uncommon for small cap stocks to solicit positive analyst coverage with a view to triggering high volume trades and share price appreciation. This is dangerous as overvaluation can lead to a sudden drop in price as well as to increased price and volume volatility when operational information becomes available. Since objectivity seems to be no longer questionable, let us dive into valuation. Price to sales ratio (which is calculated by dividing a company’s market cap with the revenue) is the preferred metric for valuating this stock and the broader cannabis sector. Price to sales ratio is preferred over the more traditional price to earnings (PE) ratio when dealing with growth-stage players in emerging industries like cannabis that still have limited or negative earnings. At the current price of $0.53 and the 2017 revenue of $14.5 million, POTN has a price to sales ratio of around 9.8x. At SeeThruEquity’s price target of $1.25 and revenue estimate of $22.8 million for 2018, POTN will have a potential price to sales ratio of 14.7x which is much lower than the industry average of 51.2x, as illustrated in the SeeThruEquity report. This essentially means that the stock is undervalued at the present—it is below the price target’ valuation and the industry average. As a new industry is introduced to investors, there is typically a lot of speculation about the involved companies due to limited information about these companies and the sector. This usually drives valuation through the roof and can potentially create bubbles. A case in point is the dot com bubble back in the 2000s. At the height of the bubble, the average price-to-sales ratio of the five largest tech companies—Dell, Intel (NASDAQ: INTC), Microsoft (NASDAQ: MSFT), Oracle (NYSE: ORCL) and Cisco (NASDAQ: CSCO)—was 20.57x. As the tech industry matured and more information became available, the sector became more fairly valued. This is illustrated by the average price to sales ratio of 4.3x in the fourth quarter of 2017. The same dynamic is playing out in the cannabis sector. Since the sector is relatively young, valuations are currently high. They have in fact increased more rapidly in recent months due to hype around legalization in Canada and states like California in the U.S. As noted earlier, the industry average price-to-sales ratio is currently 51.2x. 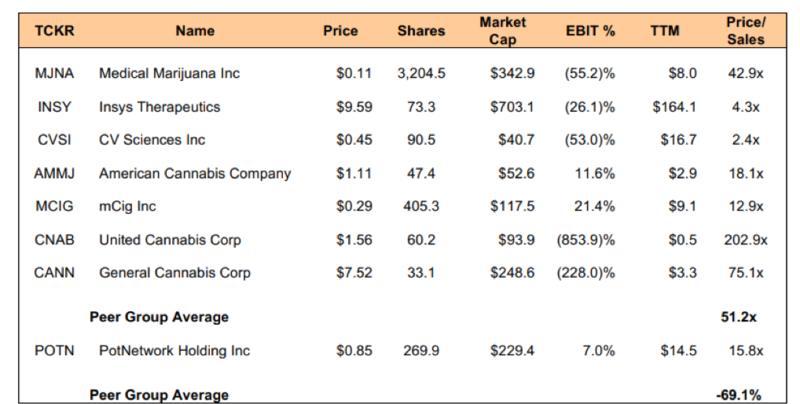 Canadian players like Aurora Cannabis even have a price-to-sales ratio of 130x, underlining the high valuations. Comparatively, POTN is undervalued. Considering POTN is undervalued, the key concern for investors should be whether the company has the potential to grow sales in line with SeeThruEquity’s projections. Based on past performance, POTN is likely to perform well in 2018. What is not clear at the moment is whether it will be able to grow its revenues to $22.8 million by end year, as estimated by SeeThruEquity. Past performance is not always an accurate indicator of future performance, especially in a fast paced industry like cannabis where unforeseen regulatory changes can radically reorient the industry’s growth trajectory. Moreover, the cannabis sector is getting more competitive by the day due to its high growth potential. According to the Hemp Business Journal, CBD is one of the fastest growing market categories in the US hemp and legal marijuana industries with an estimated CAGR of 53% till 2020. The hemp industry is projected to grow to $1.8 billion by 2020, with $450 million comprising from hemp derived CBD products. This growth will attract competitors, pressuring POTN to invest more in marketing and business development. As of the third quarter of 2017, competitors such as Medical Marijuana (OTC PINK: MJNA), which also deals with hemp-based CBD, had channeled more than $337 million in business investments. This is the highly competitive space in which POTN is operating in. It would be prudent to discount POTN’s estimated 2018 sales of $22.8 million sales by at least 20% to around $17 million. This is based on the company’s performance in the first nine months of 2017. For revenue of $9.5 million during the period, it had cost of goods of $5.9 million, representing around 62% of total sales. Working with this logic, the company would need at least $14.1 million (62 % of $22.8 million) over and above operating expense to hit the estimate. It may be difficult to raise this kind of money in 2018 given the increased competition and uncertainty that will characterize the sector this year. Rising $10.5 million is more probable, translating to sales of $17 million based on historical cost of sales. Working with a price to sales ratio of 14.7x and projected sales of $17 million, we give it a price target of $0.92. The stock might miss the psychologically critical $1 share price by a whisker, but is still a speculative buy with significant upside potential.